TARSES APARTMENTS BARS SARAH PALIN! Joe Biden may be next. Vice presidential candidate Sarah Palin frequently describes herself as a "hockey mom," but what is a "hockey mom"? In her acceptance speech at the Republican National Convention last month, Gov. Palin told the convention that the only difference between a hockey mom and a pit bull is lipstick. Well, I'm sorry Gov. Palin, but I have a strict 'no pit bull' policy. I do not allow pit bulls at any of my properties - with or without lipstick. I have a page on my web site that explains my policy on pit bulls in more detail. Go to: Pit Bulls. But....is Gov. Palin a pit bull with lipstick or a barracuda? I'm confused. Sarah Palin has long been known as "Sarah Barracuda" in Alaska, and she sometimes uses that term to describe herself. During Gov. Palin's acceptance speech at the Republican convention, the band played the song "Barracuda." 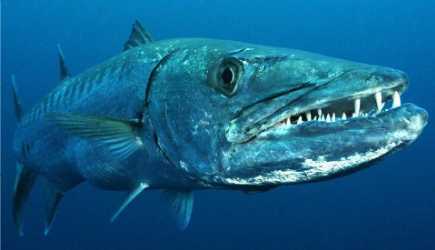 While I don't have a policy on barracudas, frankly, I don't want them in my apartments either. Now, it looks like I may have to ban Joe Biden as well. The London Times, Newsweek, The New Yorker, and many other publications have referred to Joe Biden as "Obama's attack dog," and I don't allow attack dogs at my properties. REVENUE SHARING. Its the biggest scam on Wall Street, and you've probably never heard of it. Every stock broker has a list of "recommended" mutual funds. But...do you know how mutual funds get onto those "recommended" lists? Stock brokers tell their clients that their "recommended" lists are prepared by a team of highly trained analysts, based on years of experience and secret investment formulas. However, that's not really how it works. Mutual funds pay stock brokers to be placed on their "recommended" lists, and the more a mutual fund pays, the more "recommended" it is. It's as simple as that! This practice is called "revenue sharing" on Wall Street, and mutual funds pays stock brokers hundreds of millions of dollars every year to get onto those "recommended" lists. This sounds a lot like payola, doesn't it? My dictionary defines payola as "a bribe paid to an influential person to promote a commercial product." When I tell people about revenue sharing, the usual reaction that I get is: "They can't do that! That's got to be illegal!" Well no, it isn't illegal, although I think it should be. As long as somewhere in the forms you received when you opened your account with your broker, they disclosed that they have "revenue sharing agreements" with the mutual funds that they are recommending, then its all perfectly legal. Frankly, I have never known anyone who actually read those disclosure forms. They are long winded documents, written in legalese, printed in small type, and the section dealing with "revenue sharing" is usually in the back. Now, what kind of mutual funds do you suppose pay stock brokers to get "recommended"? The bad ones, of course! Good mutual funds, the ones that consistently outperform their index, don't need to pay stock brokers to get people to invest money in them. However, mutual funds that are run by fools and thieves and that lose money year after year can only get people to invest in them by paying brokers to recommend them. So, the worse a mutual fund is, the more likely it will be on a broker's "recommended" list! Now, doesn't that stink? Many major brokerage firms not only seek revenue sharing payments, they demand them! On the Smith Barney web site, Smith Barney Revenue Sharing, Smith Barney says that mutual funds that refuse to give them revenue sharing payments will be denied access to their branch offices! Don't confuse revenue sharing with commissions. Commissions appear on the statements you get from your stock broker, so you know how much they are. Brokers don't send out revenue sharing statements, so you have no way of knowing how much your broker was paid to "recommend" the mutual funds you bought. Now tell the truth - had you ever heard of "revenue sharing" prior to reading this? I know people who have been investing in mutual funds for over 30 years, but when I told them about revenue sharing, none of them had ever heard about it before, and many didn't believe me. Well sorry folks, but this really is is how it work! Revenue sharing is the main reason why most mutual funds sold by stock brokers underperform the market and their index year after year. Incidentally, many other types of investments that are sold by stock brokers, banks, insurance agents, and financial advisers, get "recommended" this same way. Ach du lieber! German chocolate has nothing to do with Germans or Germany. In 1852, an Englishman named Samuel German who was living in the United States and employed by Baker's Chocolate Company invented the first practical sweetened chocolate bar, which he named after himself. If you look at the package closely, you will see that the label doesn't say "German Chocolate." It says "German's Chocolate." Note the apostrophe and 's' after "German." German Chocolate Cake isn't German either. The recipe for this popular cake was invented by a Texas housewife and first appeared in print in a Dallas newspaper in 1957. 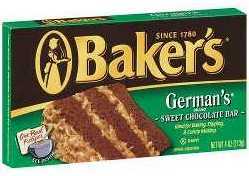 The cake was originally called "German's Chocolate Cake" because German's Chocolate is a principal ingredient, but over time, nearly all magazines and cookbooks dropped the apostrophe and "s" after "German" when reprinting the recipe. 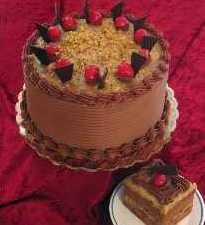 It is now widely believed all over the world that German chocolate cake is a traditional German dessert. In July, 2008; Republican presidential candidate John McCain had dinner at Schmidts' Sausage Haus in Columbus, Ohio. According to a local newspaper, McCain was served "an old-fashioned German meal consisting of Sauerkraut-Bratwurst Balls, Hoffbrau-Schnitzel, and German Chocolate Cake." Baker's Chocolate wasn't made for bakers. America's oldest chocolate company is Baker's Chocolate Company, which was established in 1780 in Dorchester, Massachusetts by Dr. James Baker. James Baker was the first person to mass produce chocolate in America, which he sold in cake form. Dr. Baker didn't market his product for baking, but for making making hot chocolate beverages. What Do You Do With The Money? Every once in a while, I get an application from somebody who doesn't understand the concept of rent. These people are usually 'trust fund babies', young adults who grew up with great wealth, often in gated communities, and detached from the real world. One of these applicants was a woman named Amanda. Amanda was a first year student at U.C. Berkeley. She was intelligent, well dressed, pretty, and polite. After Amanda filled out a rental application form, I asked Amanda if she had any questions. She said: "Yes. If I rent this house, then I have to give you $1,200 a month. Is that right?" I said: "Yes." Then Amanda said: "And what do you do with the money?" I shrugged my shoulders and said: "I spend it." Amanda smiled and said: "No, seriously. What do you do with the money?" I said again: "I spend it." The smile vanished from Amanda's face and was replaced by a look of disbelief. She said: "You can't do that!" I had dealt with people like Amanda before, so I knew what to say. I said: "Amanda, paying rent isn't like putting money into a bank account. When you give me a rent check, it becomes my money, and I can spend it as I like." Amanda wasn't stupid, but nobody had ever explained Capitalism to her before! Amanda assumed that paying rent was like putting money into a savings account. She thought that when a tenant moved out of an apartment, the landlord returned all the rent he received! (I am sure that tenants everywhere would be very happy if rent actually worked that way, but of course, it doesn't.) The next day, Amanda called me on the phone to tell me that she was withdrawing her application. A few weeks later, I ran into Amanda at Barnes & Noble. We had a nice conversation. Amanda told me that her father had purchased a house on Le Conte Avenue, 2 blocks from campus, and was going to let her live there rent-free until she graduated. At that time, the cheapest house on Le Conte was about $500,000. Amanda told me: "This is much nicer than renting!" Well, I couldn't argue with that! I think Amanda was aware of the fact that the parents of most U.C. Berkeley students don't have the wherewithal to buy half million dollar houses for their children, but I'm not sure. Today, the cheapest house for sale on Le Conte is over $1 million, so Amanda's father did very well for himself. You might find this hard to believe, but there are a lot of students at U.C. Berkeley like Amanda. I personally know several realtors in Berkeley who make good livings selling houses to wealthy parents of Cal students. The Simpsons is going to be getting a lot more political over the next few months, and I am looking forward to that. They will be dealing with some very sensitive and topical issues. In one upcoming episode, The Simpsons will lose their house in foreclosure. Then Ned Flanders buys the house and rents it back to Homer and Marge. In another episode, when Bart befriends a Muslim boy, Homer suspect's the boy's parents of organizing a terrorist attack. In another episode, Homer tries to vote for Barrack Obama, but the voting machine won't let him. This is pretty edgy stuff! NEW IN THE CHOCOLATE SHOP. CORNBREAD MIX. This can also be used to make corn muffins. Just add water! Everything else is in the jar, including unsaturated canola oil. Almost all commercial brands of cornbread and other baking mixes contain fats that are bad for you: lard, beef tallow, palm oil, or hydrogenated vegetable oil. Hydrogenation converts unsaturated vegetable oil (which is good for you) into saturated fat and trans fat (which are bad for you.) The reason that food processors put saturated fats in their mixes is that unsaturated vegetable oil has a short shelf life, as exposure to oxygen in the air makes it go rancid. There is a simple solution to that problem. I vacuum seal all my mixes in canning jars, so there is no exposure to air. This is the reason why peanuts and other oily nuts taste better when they come in vacuum sealed cans and jars.